CARL LUSTER was a Vaudevillian Actor who performed with stars like CHARLIE CHAPLIN and SOPHIE TUCKER. Another actor he knew and performed with was ED WYNN. The act that he founded – THE LUSTER BROTHERS – toured across country and overseas with comedic acting and astonishing acrobatic feats that thrilled audiences. 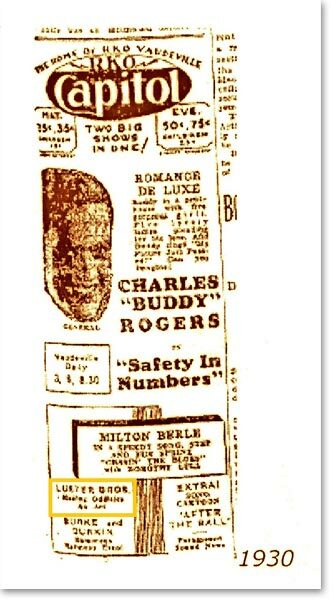 In 1930, CARL LUSTER opened for MILTON BERLE. 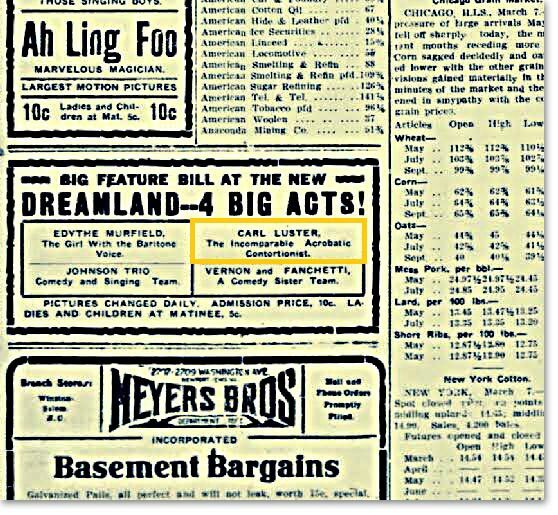 At the height of his career,CARL LUSTER performed at THE PALACE THEATRE three times in New York City; the same theater first opened ORSON WELLES' CITIZEN KANE years later. 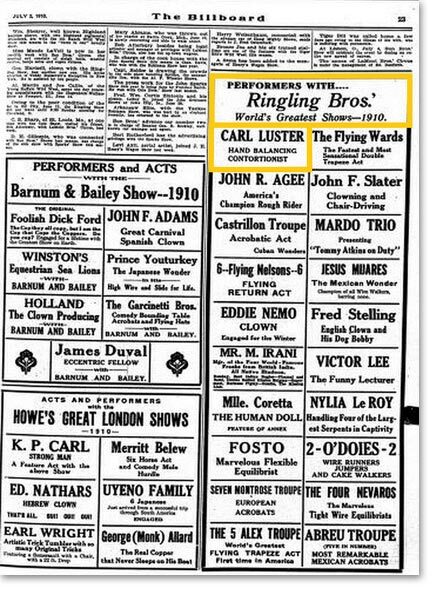 Mainly a Vaudeville actor, CARL LUSTER was also a starring act for such circuses like RINGLING BROTHERS, HAGENBECK-WALLACE CIRCUS, and others. CARL LUSTER narrowly survived the infamous, circus train wreck of 1918. Read all about that and more as CULTMACHINE'S SHARON JORDAN sits down with SHANNON LUSTER about CARL LUSTER, her great-grandfather, who puts more than one meaning in the word, great! 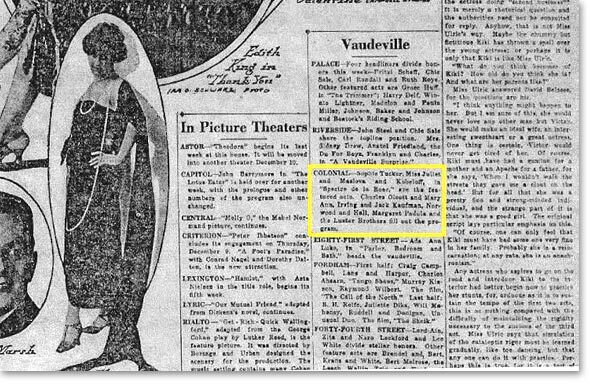 SHARON JORDAN: CARL LUSTER, your great-grandfather, was a Vaudeville Actor. Who were some of the famous people that Carl Luster knew and worked with? SHANNON LUSTER: There were a number of famous stars that Carl Luster worked with over the years. I will highlight a few here. 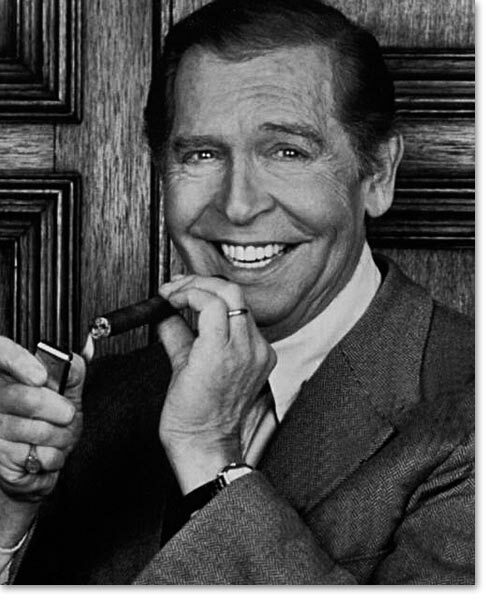 In 1930, Carl Luster performed with MILTON BERLE. 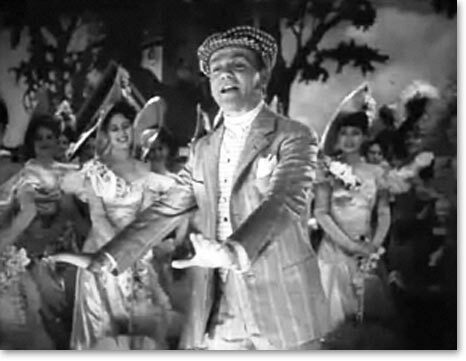 Carl also performed with CHARLIE CHAPLIN. 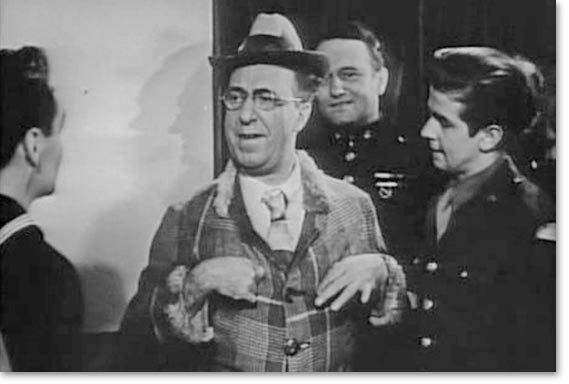 Another actor that he knew and performed with was ED WYNN. Sometimes, while Carl was on tour, he would bring his entire family along with on the road. 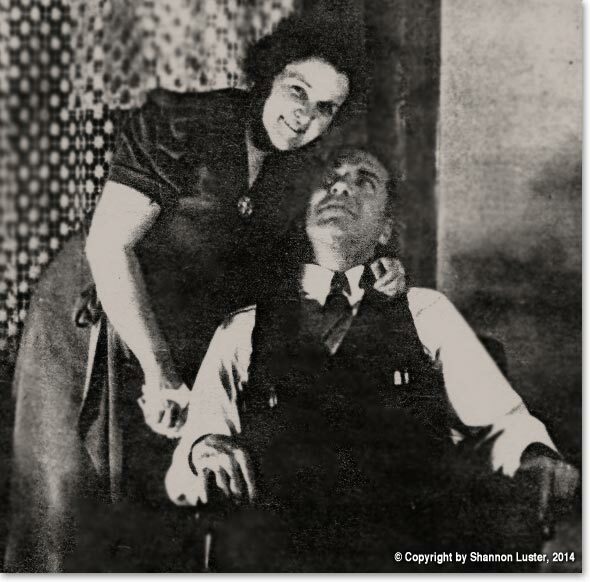 In fact, he met LOUISE KOLB while touring and later, they married and started a family together. Their son and my grandfather, WYATT LUSTER, was adored by SOPHIE TUCKER. 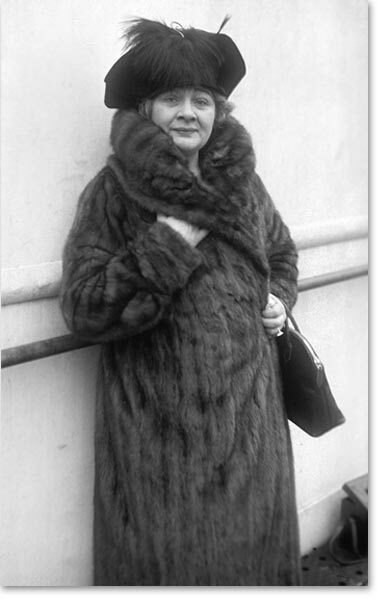 When Wyatt was a baby, Sophie Tucker would hold him and complimented him, saying she would like a son like him. 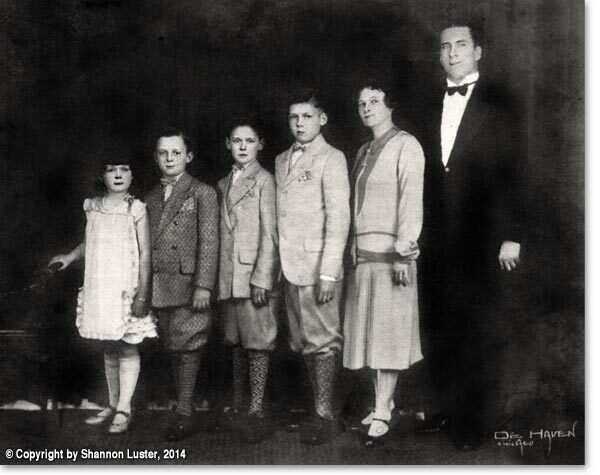 At the time, Carl Luster was on tour with Sophie Tucker and brought his family along with him on the road. SJ: Carl Luster performed at The Palace Theatre at the height of his career. Would you like to share more about that? SL: If you stepped on that stage and performed there, it meant you made it. 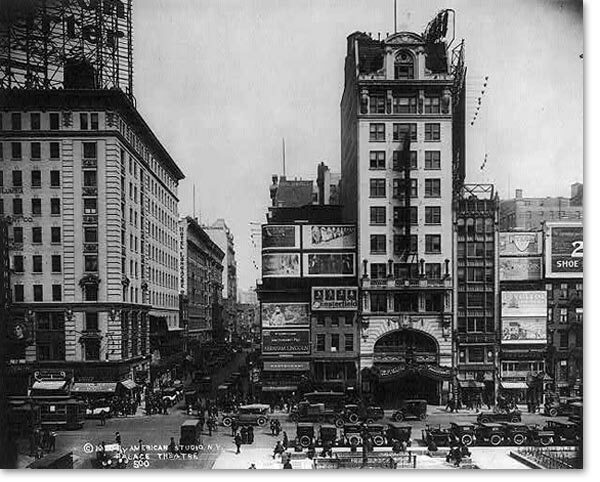 The Vaudevillians often called the Palace Theatre simply The Palace. There was no higher compliment to your skill as a performer, as a Vaudevillian, than showing there at The Palace. At the peak of his career, Carl performed at The Palace three times in New York. His young son, traveling with him, once recalled looking over Times Square when parts of it were still being built. SJ: I heard Carl Luster toured across the United States and also overseas. Would you like to share some details about that? SL: Absolutely! Carl Luster had the chance to tour across the United States from New York City to San Francisco and every stop in between. His career, starting in the 1910s and into the late 1930s, lasted a long span, providing plenty of opportunities to perform his act. Sometimes, the billboards read Carl Luster. Other times, he was the founder of an act called The Luster Brothers. It depended upon the circuit that he worked for at the time. Carl Luster often toured and performed his act of acting and thrilling feats in the Orpheum Theatres as well as the B. F. Keith Theatres, among other Vaudeville theater circuits. In addition, Carl Luster toured overseas including England, Germany, France, and other countries. SJ: In addition to being a talented actor, I heard Carl Luster was a starring act for different circuses like Ringling Brothers and Hagenbeck-Wallace Circus. What would you like to share about his days as a headlining act? SL: Carl was talented at riding tricks, including Roman riding, a type of Trick Riding. Carl stood, one foot on the back of one horse and one foot on the other, with a horse in between. Traditionally, two horses were used for this type of trick riding, but Carl used three. Carl Luster was also skilled at acrobatics and at tight rope tricks when there used to be no nets below. He survived being shot out of a cannon and while in the air, he did three flips in a row and landed on a trampoline. Later on, Carl found out that other men had died attempting to accomplish the feat that he had just successfully completed. Those are just a few of Carl Luster's talents while touring during the summer as a starring act in the circus circuit. 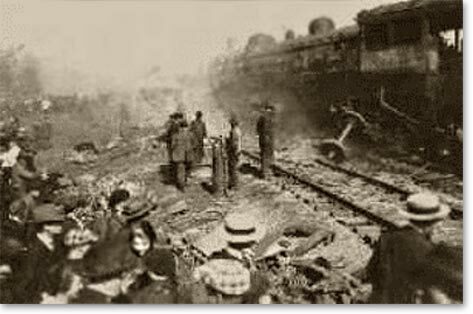 SJ: Your great-grandfather, Carl Luster, nearly died in the Hagenbeck-Wallace Circus train crash of 1918 (also called the Hammond Circus Train Wreck.) Would you like to share anything about that? SL: I think Carl Luster's own words describes the Hagenbeck-Wallace Circus train crash best. This quote comes from his manuscript that he planned on turning into a screenplay. "What horror greeted my eye I shall never forget. There was number 17, 16, 15 and number 5 cars in a heap and burning furnace. I could not do any help and there, on top in front of your eyes, was beautiful lady. The animal trainer caught with a piece of iron around her legs, holding her to be burned up in front of your eyes, begging someone to kill her before the fire gets to her… There was 115 killed and burned. Over half could have been saved if the fire had not come." Because of a mix up with the sleeping chart, Carl was sleeping in another car on the train than he usually did. However, if he had been sleeping in his regular car (2), he would likely have died in the train crash. And I would not be here discussing the accomplishments of my great-grandfather – Carl Luster – today. SJ: I heard Carl Luster left a manuscript of his life that he planned on turning into a screenplay. What motivated Carl Luster to write about his life? 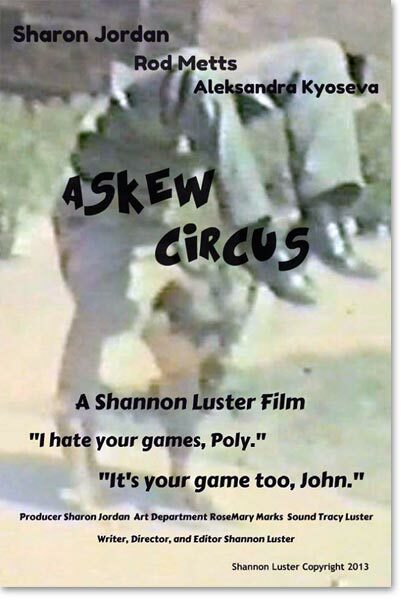 SJ: Carl Luster appears in ASKEW CIRCUS, a film you wrote and directed. Would you like to share some details about that? SL: Certainly! 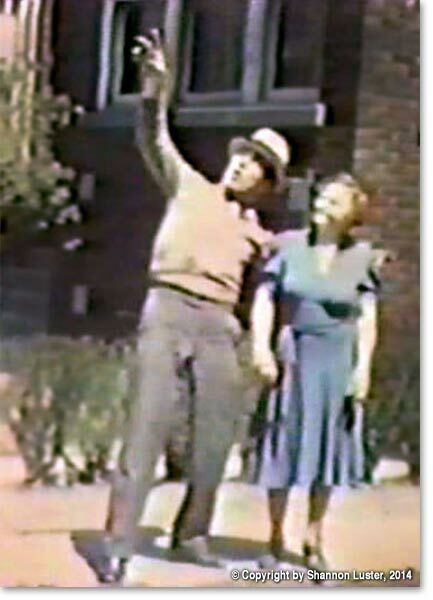 I had access to the family home movies that included CARL LUSTER performing some of his acrobatic tricks in front of the family home in Chicago, Illinois. 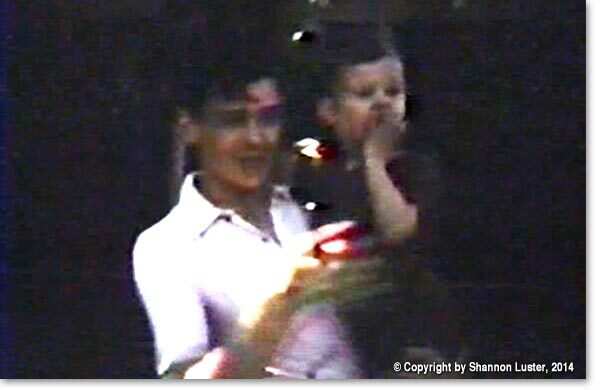 I took that footage and more to incorporate it into ASKEW CIRCUS. What I envisioned for Askew Circus is a dysfunctional family reunion that ends with a twist and a rather fatal one at that. Three people – Poly Askew, John Askew, and Brandi Askew – enter the house but only two come out - alive. Two other interesting facts, Carl Luster is on the official poster and also the official trailer for Askew Circus. SJ: Has Carl Luster inspired you in your career? How about in your personal life? If so, how? SL: My great-grandfather's life has impacted me personally several ways. Since Carl Luster has left behind a manuscript chronicling his days as a Vaudevillian actor as well as his days headlining for the circus, I have had a personal glimpse into a man who I did not meet in person. Carl's dedication to his craft – he started working at 11-years-old to perfect his skill – has inspired me to place as much dedication into any challenge or opportunity that is presented before me that I wish to pursue. "I do not know that your soul does remain as alert as it is in your body after death," was a direct quote from Carl Luster after nearly dying that has also stuck with me. SJ: Is there anything else about Carl Luster that we have not covered that you would like to discuss? SL: That is a good question, and the answer is yes. Currently, I am in the research stage for writing both a novel and screenplay based upon my great-grandfather's life. Carl Luster truly was a remarkable performer, and I am proud to sport his last name. So keep your eyes open for the novel and screenplay! Thank you, Sharon Jordan, for this interview opportunity with Cultmachine. I truly appreciate it, and it's been fun.